^ PR Newswire (November 17, 2017). "IMAX and Cineplex Launch Canada's First IMAX VR Centre at Scotiabank Theatre Toronto". markets.businessinsider.com. finanzen.net GmbH. ^ Cheng, Jennifer (November 3, 2017). "Inside the newly restored Cinesphere at Ontario Place". Toronto Life. Toronto Life Publishing Company Limited. Retrieved November 11, 2018. ^ "Imax theater in Riverfront Park headed for demolition; fate of pavilion rides still in question". The Spokesmen-Review. September 30, 2016. Retrieved May 24, 2017. ^ Giardina, Carolyn. 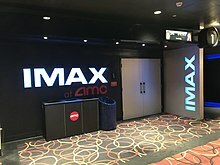 "Imax Expands Footprint in Theaters With Launch of New Laser Projection System". The Hollywood Reporter. Retrieved April 25, 2018. ^ "We're getting a make-over! - IMAX Sydney". Retrieved December 2, 2018. ^ Pegoraro, Rob (August 31, 2016). "IMAX wants to add VR to your next movie". Yahoo! Finance. Retrieved December 21, 2018. ^ a b Roettgers, Janko (December 13, 2018). "Imax Is Shutting Down Its VR Business, Closing Remaining Three VR Centers in Q1". Variety. Retrieved December 21, 2018. ^ Roettgers, Janko (January 4, 2017). "Imax to Open VR Experience Center in Los Angeles This Week". Variety. Retrieved December 21, 2018. ^ a b Lang, Brent (May 7, 2015). "'Avengers: Infinity War' to Be Shot Entirely With Imax Cameras". Variety. Variety Media, LLC. Retrieved March 7, 2016. ^ "IMAX 3D Theater | Kennedy Space Center Visitor Complex". www.kennedyspacecenter.com. Retrieved April 18, 2017. ^ Stromberg, Joseph. "The Space Shuttle's IMAX Cameras Touch Down at Air and Space". Smithsonian. Retrieved April 18, 2017. A sprocket or sprocket-wheel is a profiled wheel with teeth, cogs, or even sprockets that mesh with a chain, track or other perforated or indented material. The name sprocket applies generally to any wheel upon which radial projections engage a chain passing over it and it is distinguished from a gear in that sprockets are never meshed together directly, and differs from a pulley in that sprockets have teeth and pulleys are smooth. Early automobiles were driven by sprocket and chain mechanism. Sprockets are of designs, a maximum of efficiency being claimed for each by its originator. Sprockets typically do not have a flange, some sprockets used with timing belts have flanges to keep the timing belt centered. They can be run at speed and some forms of chain are so constructed as to be noiseless even at high speed. In the case of bicycle chains, it is possible to modify the overall ratio of the chain drive by varying the diameter of the sprockets on each side of the chain. This is the basis of derailleur gears, a multi-speed bicycle, by providing two or three different-sized driving sprockets and up to 11 different-sized driven sprockets, allows up to 33 different gear ratios. It is considered to be the most successful Worlds Fair of the 20th century with the most attendees to that date and 62 nations participating. It set the attendance record for a worlds fair. Expo 67 was Canadas main celebration during its centennial year, the project was not well supported in Canada at first. It took the determination of Montreals mayor, Jean Drapeau, defying a computer analysis that said it could not be done, the fair opened on time. After Expo 67 ended in October 1967, the site and most of the continued on as an exhibition called Man and His World. By that time, most of the buildings — which had not been designed to last beyond the original exhibition — had deteriorated and were dismantled. Today, the islands hosted the world exhibition are mainly used as parkland and for recreational use. The exposition was offered first to Toronto but politicians there rejected the idea, Montreals mayor, Sarto Fournier, backed the proposal, allowing Canada to make a bid to the Bureau International des Expositions. 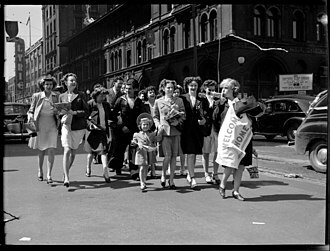 At the BIEs May 5,1960 meeting in Paris, Moscow was awarded the fair after five rounds of voting that eliminated Austrias, in April 1962, the Soviets scrapped plans to host the fair because of financial constraints and security concerns. Montreals new mayor, Jean Drapeau, lobbied the Canadian government to try again for the fair, several sites were proposed as the main Expo grounds. 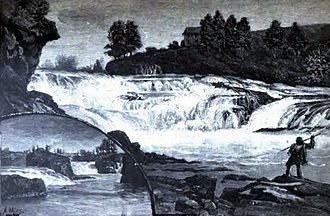 One location that was considered was Mount Royal Park, to the north of the downtown core, but it was Drapeaus idea to create new islands in the St. Lawrence river, and to enlarge the existing Saint Helens Island. 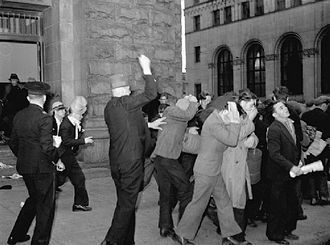 The choice overcame opposition from Montreals surrounding municipalities, and prevented land speculation, Expo did not get off to a smooth start, in 1963, many top organizing committee officials resigned. Another more likely reason for the resignations was that on April 22,1963. Canadian diplomat Pierre Dupuy was named Commissioner General, after Diefenbaker appointee Paul Bienvenu resigned from the post in 1963, one of the main responsibilities of the Commissioner General was to attract other nations to build pavilions at Expo. Transformers, The Last Knight is an upcoming 2017 American science fiction action film based on the toy line created by Hasbro. It will be the fifth installment of the live-action Transformers film series, and this film marks the final picture in the franchise directed by Bay. The film is scheduled to be released on June 23,2017 by Paramount Pictures in 2D, 3D, in the absence of Optimus Prime, a battle for survival has commenced between the human race and the Transformers. Cade Yeager forms an alliance with Bumblebee, an English lord, at the sudden betrayal of Optimus Prime, the humans have no choice but to strike a deal with Megatron. Mark Wahlberg as Cade Yeager, a father and struggling inventor who helped the Autobots during the events of Age of Extinction. Stanley Tucci as Joshua Joyce, the head of K. S. I. who created a series of human-made Transformers during the events of Age of Extinction. Isabela Moner as Izabella, a tomboy who was orphaned during the Chicago War in Dark of the Moon with Sqweeks as her only friend until meeting Cade. Josh Duhamel as William Lennox, a N. E. S. T, soldier who partnered with the Autobots prior to the events of Age of Extinction. Tyrese Gibson as Robert Epps, a former N. E. S. T, soldier who partnered with the Autobots prior to the events of Age of Extinction. John Turturro as Seymour Simmons, a government agent turned successful writer who allied with the Autobots prior to the events of Age of Extinction. Laura Haddock as Vivian Wembley, a professor at the University of Oxford who teams with Yeager, Anthony Hopkins as Sir Edmund Burton, an astronomer and historian who knows about the history of the Transformers on Earth. Bumblebee, a young Autobot scout who transforms into a custom-built yellow, John Goodman voices Hound, an Autobot commando and field medic who transforms into a Mercedes Unimog military tactical ambulance. Hot Rod, a brash and arrogant Autobot who transforms into a Citroën DS and switches it for a gunmetal gray and he is brother-in-arms with Bumblebee and speaks in a French accent. Transformers, Age of Extinction is a 2014 American science fiction action film based on the Transformers franchise. It is the installment of the live-action Transformers film series. Like its predecessors, it was directed by Michael Bay and written by Ehren Kruger, with Steven Spielberg and it stars Mark Wahlberg, with Peter Cullen reprising his role as the voice of Optimus Prime, as the lead roles. Returning Transformers include Optimus Prime, Ratchet, Brains, the film was released on June 27,2014, in IMAX and 3D. Transformers, Age of Extinction was panned by critics, many of whom considered it poorly directed, poorly acted, having awful product placement, according to Rotten Tomatoes, it is the worst reviewed film in the series, holding an 18% approval rating. However, many praised the effects, the action sequences, Steve Jablonskys musical score, and the performances of Wahlberg, Bingbing, Cullen. Despite the poor reviews, the film was a box office success. It was the film to gross over $1 billion in 2014. A fifth film, The Last Knight, is set to be released on June 23,2017, with Cullen and Wahlberg returning, in the present day, geologist Darcy Tirrel excavates the Transformium for K. S. I. Industries, who use the alloy to create man-made artificial Transformers. Its been five years since Battle of Chicago took place, and he is aided by James Savoy, a ruthless CIA agent working as his right-hand man, who despises the Autobots after losing his sister during the Battle of Chicago. Lockdown loses track of Optimus in Mexico City, instead killing Ratchet when he refuses to give up his leader’s whereabouts, damaged in Mexico City and disguised as a rundown semi-truck, is discovered by Cade Yeager, a financially struggling Texan inventor. Lucas calls Cemetery Wind who attacks the Yeager farm, but Optimus, during the pursuit, Lucas is killed by one of Lockdown’s grenades. Optimus summons the surviving Autobots – Bumblebee, Drift, using a CIA drone he stole during the home invasion and the Autobots learn the Deaths of Ratchet and Leadfoot and Cade discovers K. S. I. The 1986 World Exposition on Transportation and Communication, or simply Expo 86, was a Worlds Fair held in Vancouver, British Columbia, Canada from Friday, May 2 until Monday, October 13,1986. The fair, the theme of which was Transportation and Communication, World in Motion - World in Touch and it was the second time that Canada held a Worlds Fair, the first being Expo 67 in Montreal. It was the third Worlds Fair to be held in the Pacific Northwest in the previous 24 years as of 1986, the logo of three interlocking rings to make the 86 in the logo stood for the three main modes of transportation, land and water. Up until the late 1970s, the 173 acre site on False Creek, where Expo was staged, was a former CPR rail yard, in 1978, Sam Bawlf proposed an exposition to celebrate Vancouvers centennial year. 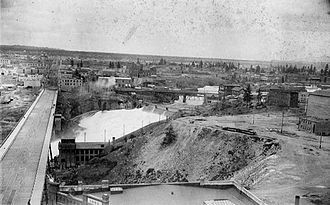 The proposal was submitted in June 1979, for a fair that was to be called Transpo 86, in 1980, the British Columbia Legislature passed the Transpo 86 Corporation Act, paving the way for the fair. The transportation theme reflected the role in connecting Canada by rail, its status as a major port and transportation hub. The initial idea was to have. a modest $80 million transportation exposition that would mark Vancouvers 100th anniversary and it soon blossomed into a full exposition thanks to the help of the Vancouver Exposition Commissioner-General at that time, Patrick Reid. The theme of Transportation and Communication led to the conglomeration of different exhibits of transportation networks. This included a monorail that glided over the crowds that included a trip to every zone, other ground transports included the SkyTrain, a High Speed Surface Transport from Japan, and a French People Mover. The transport of the sky was the Gondola, a boxcar hovering high in the air, the water taxis moved along four different ports on the site. The fair was awarded to Vancouver by the Bureau International des Expositions in November 1980, local business tycoon Jim Pattison was appointed as CEO, and would eventually become the president of the corporation. The chief architect selected was Bruno Freschi, the Creative Director was Ron Woodall, construction started in October 1983, when Elizabeth II, Queen of Canada, started a concrete mixer on the future site of the Canada Pavilion, and offered the invitation to the world. However, work was disrupted by labour disputes for five months, Expo Centre opened May 2,1985, as a preview centre for the fair. The fair was originally budgeted for a modest CAN$78 million, final expenditures for the expanded event totaled $802 million, with a deficit of CAN$311 million. 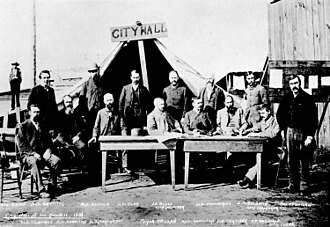 Mike Harcourt, the mayor at the time, hoped provincial laws might be changed to protect these residents. The Patricia Hotel was among those establishments that evicted most or all of its residents, who had lived at the Patricia Hotel for decades, was well known in the community but was evicted with just a weeks notice. Although he was found a new home, he became despondent, stopped eating, Expo 86 was opened by Charles, Prince of Wales, Princess of Wales, and Prime Minister Brian Mulroney on Friday, May 2,1986. The Arri Alexa is a digital motion picture camera system made by Arri first introduced in April 2010. The camera was Arris first major transition into digital cinematography after smaller previous efforts such as the Arriflex D-20 and it features modularity, PL mount lenses, a Super 35 sized CMOS sensor shooting up to 2880×2160 resolution and supports uncompressed video or proprietary raw data. The price of the camera depends on model and accessories, as an example, in 2015 an Arria Alexa XT cost approximately US$66, 000-100,000, the range of Alexa models has expanded over time, The first camera of the Alexa product family. The ARRI ALEXA’s CMOS Super-35mm sensor is rated at 2. 8K and that sensitivity allows the camera to see a full seven stops of over exposure and another seven stops of underexposure, an unprecedented Dynamic Range. The ALEXA Plus added integrated wireless remote control, the ARRI Lens Data System, additional outputs, lens synchronization for 3D, and built-in position and motion sensors. The Alexa M had its imaging and processing unit broken down in two parts to be small and lightweight for 3D rigs and other uses where size is a concern. The Alexa Studio features an optical viewfinder, mechanical shutter, in February 2013, the range was renewed as Alexa XT. This module records on dedicated SSD drives, further improvements are an internal ND filter unit, a 4,3 sensor and a quieter cooling fan. The range accordingly comprises the Alexa, the Alexa XT, the Alexa XT M, the Alexa XT Plus, the Alexa XT Studio, existing cameras can be upgraded with the XR module for internal RAW recording. On 21 September 2014 at the Cinec convention in Munich, Arri announced the Alexa 65, as with cameras from competitor Panavision, the Alexa 65 camera was available by rental only, provided through the ARRI Rental Group. The Alexa 65 uses the A3X sensor, which has a maximum resolution of 6560x3100. The first production to use the camera was Mission Impossible - Rogue Nation, which was used to shoot the underwater sequence, other films where specific sequences were shot with the Alexa 65 include Rogue One, A Star Wars Story, The Huntsman and The Divergent Series, Allegiant. The Fox Film Corporation was an American company that produced motion pictures, formed by William Fox on 1 February 1915. It was the successor to his earlier Greater New York Film Rental Company. On July 23,1926, the company bought the patents of the Movietone sound system for recording sound on to film, after the Crash of 1929, William Fox lost control of the company in 1930, during a hostile takeover. Under new president Sidney Kent, the new owners merged the company with Twentieth Century Pictures to form 20th Century Fox in 1935, William Fox entered the film industry in 1904 when he purchased a one-third share of a Brooklyn nickelodeon for $1,667. Fox invested further in the industry by founding the Greater New York Film Rental Company as a film distributor. In 1914, reflecting the broader scope of his business, he renamed it the Box Office Attraction Film Rental Company and he continued to distribute material from other sources, such as Winsor McCays early animated film Gertie the Dinosaur. Later that year, Fox concluded that depending on other companies for the products he depended on was insufficient and he purchased the Éclair studio facilities in Fort Lee, New Jersey, along with property in Staten Island, and arranged for actors and crew. The company became a studio, with its name shortened to the Box Office Attractions Company. Always more of an entrepreneur than a showman, Fox concentrated on acquiring and building theaters, in 1917, William Fox sent Sol M. Wurtzel to Hollywood to oversee the studios West Coast production facilities where a more hospitable and cost-effective climate existed for filmmaking. Fox had purchased the Edendale studio of the failing Selig Polyscope Company, with the introduction of sound technology, Fox moved to acquire the rights to a sound-on-film process. In the years 1925–26, Fox purchased the rights to the work of Freeman Harrison Owens and this resulted in the Movietone sound system known as Fox Movietone developed at the Movietone Studio. CinemaScope is an anamorphic lens series used, from 1953 to 1967, for shooting widescreen movies. Its creation in 1953 by Spyros P. Skouras, the president of 20th Century Fox, marked the beginning of the modern anamorphic format in both principal photography and movie projection. The anamorphic lenses theoretically allowed the process to create an image of up to a 2.66,1 aspect ratio, although the CinemaScope lens system was made obsolete by new technological developments, primarily advanced by Panavision, the CinemaScope anamorphic format has continued to this day. Bausch & Lomb won a 1954 Oscar for its development of the CinemaScope lens, french inventor Henri Chrétien developed and patented a new film process that he called Anamorphoscope in 1926. It was this process that would form the basis for CinemaScope. He attempted to interest the motion picture industry in his invention, by 1950, cinema attendance seriously declined with the advent of a new competitive rival, television. The optical company Bausch & Lomb was asked to produce a prototype anamorphoser lens, test footage shot with these lenses was screened for Skouras, who gave the go-ahead for development of a widescreen process based on Chrétiens invention, which was to be known as CinemaScope. Twentieth Century-Foxs pre-production of The Robe, originally committed to Technicolor Three-Strip origination, was halted so that the film could be changed to a CinemaScope production, two other CinemaScope productions were planned, How to Marry a Millionaire and Beneath the Twelve-Mile Reef. 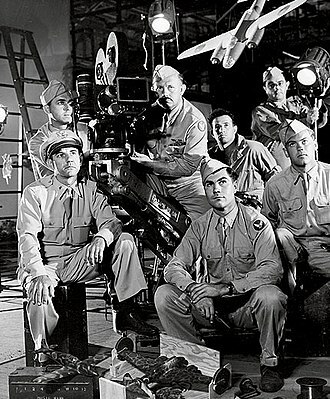 The introduction of CinemaScope enabled Fox and other studios to reassert its distinction from the new competitor, Chrétiens Hypergonars proved to have significant optical and operational defects. Ultimately Bausch & Lomb formula combined lens designs incorporated both the lens and the anamorphic lens in one unit. These combined lenses continue to be used to day, particularly in special effects units. Other manufacturers lenses are preferred for so-called production applications that benefit from significantly lighter weight or lower distortion. When, developers found that magnetic stripes could be added to the film to produce a composite picture/sound print and this reduction was kept to a minimum by reducing the width of the normal KS perforations so that they were nearly square, but of DH height. 70 mm film is a wide high-resolution film gauge for still and motion picture photography, with higher resolution than the standard 35 mm motion picture film format. As used in cameras, the film is 65 mm wide, for projection, the original 65 mm film is printed on 70 mm film. The additional 5 mm are for 4 magnetic strips holding six tracks of sound, although 70 mm prints use digital sound encoding, the vast majority of existing and surviving 70 mm prints predate this technology. Each frame is five perforations tall, with a ratio of 2.20,1. Films formatted with a width of 70 mm have existed since the days of the motion picture industry. The first 70 mm format film was most likely footage of the Henley Regatta, which was projected in 1896 and 1897, but may have been filmed as early as 1894. It required a specially built projector built by Herman Casler in Canastota, New York and had a similar to full frame. There were several film formats of various sizes from 50 to 68 mm which were developed from 1884 onwards, including Cinéorama, in 1914 the Italian Filoteo Alberini invented a panoramic film system utilising a 70 mm wide film called Panoramica. In 1928, Fox Film Corporation started working on a film format using 70 mm film which they named Grandeur. This was one of a number of wide-film processes developed by some of the film studios at about that time. However, due to resistance from movie theater owners, who were in the process of equipping their theaters for sound. Producer Mike Todd had been one of the founders of Cinerama, Cinerama employed three 35 mm film projectors running in synchronism to project a wide image onto a deeply curved screen. Although the results were impressive, the system was expensive and had serious shortcomings due to the need to match up three separate projected images. In collaboration with the American Optical company, Todd developed a system which was to be called Todd-AO and this uses a single 70 mm wide film and was introduced with the film Oklahoma. The 70 mm film is perforated at the pitch as standard 35 mm film. With a five-perforation pull-down, the Todd-AO system provides a frame dimension of 1.912 inch by 0.816 inch giving a ratio of 2.2,1. Fleet Science Center is a science museum and planetarium in Balboa Park, located in San Diego, California. It is at the east end of the El Prado Drive walkway, next to the Bea Evenson Fountain, the facility is named for aviation pioneer Reuben H. Fleet, who founded the U. S. Air Mail service. Fleets San Diego-based company, Consolidated Aircraft, built several of the aircraft of World War II, including the B-24 Liberator. Fleet and his family made the gift which established the Science Center. Throughout the 1960s, the San Diego Hall of Science was planning a new planetarium for San Diegos Balboa Park, the site on Laurel Street opposite the San Diego Natural History Museum was reserved in 1963. 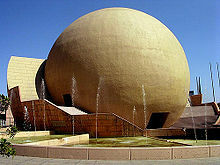 The planetarium incorporated several innovative features and it was to be used for both large-format film presentations and traditional planetarium shows. The 76-foot-diameter dome would be tilted 25 degrees, the audience would be placed in tiered rows facing outward into the tilted dome to give the feeling of being suspended in space and looking forward, rather than looking upward into an overhead dome. Spitz created a servo-controlled starball that became the centerpiece of the system, the spherical star projector and a number of independent planet projectors maintained a low profile while projecting a realistic sky for the astronomy presentations. These elements, along with a number of projectors and lighting systems, were all controlled by a PDP-15 minicomputer. 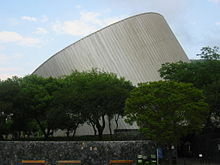 The Fleet is home to the world’s first IMAX Dome Theater, in addition to planetarium shows, the museums founders wanted to use a large-format film projection system to show movies on the domes interior. 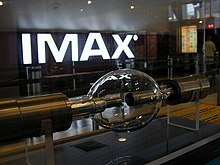 The San Diego Hall of Science approached IMAX to adapt their large-screen format, the system adopted was a modification of IMAXs 65mm format and was named OMNIMAX. The cameras would use a lens, taking in nearly a 180 degree field of view. When projected on the dome through another fisheye lens, the distortion would be reversed, the audience would have a view that was like being at the original scene, occupying nearly the entire field of vision. The Expo '74 logo design, based on the Möbius strip. Peter Max-designed U.S. postage stamp commemorating Expo '74. The Great Northern Railway Depot Clocktower in 1973, exactly one year before the Expo opened. Site of Expo '74 under construction, May 1973. A planetarium under construction in Nishapur, near the Mausoleum of Omar Khayyam. 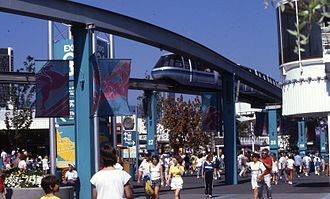 The monorail at Expo 86. After the site closed, it was shipped to England where it was installed at the Alton Towers theme park in 1987. The former Expo 86 monorail, Swiss built Von Roll Seilbahnen AG Mark II, is now installed at Alton Towers in the United Kingdom. NFB headquarters (Norman McLaren Building), Montreal, Québec. The NFB's offices in Toronto. The ground-floor Mediatheque was closed in April 2012. Original Spitz Laboratories planetarium projector array in Fleet Theater (installed 1974). Current pair of Global Immersion GSX dual 4K projectors, for both planetarium shows and digital movies in Heikoff Dome Theater (installed 2012). Tread drive sprocket of the Leclerc main battle tank (2006). Moving picture mechanism from 1914. The sprocket wheels a, b, and c engage and transport the film. a and b move with uniform velocity and c indexes each frame of the film into place for projection. The view of the ice from the last row of Toronto's Air Canada Centre with stadium seating. Panorama view of Canada Place's sails with the North Shore in the background. One of the highlights of Expo 67 was the Labyrinth Pavilion by the NFB.